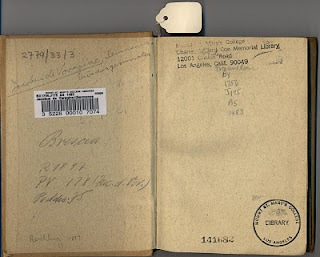 The Mount Archives blog: When is an old book... rare? When is an old book... rare? Another area in which we're typical, even for a small college, is having an interesting collection of old books. Visitors often gasp in surprise at so many "rare" volumes, but rarity and value are in the eyes of the beholder. As a Catholic college we have quite a few old and very impressive-looking Bibles, with ornate tooled-leather covers and curlicue clasps. Most of them date from the late 19th Century and aren't nearly as valuable as they look. But we have quite a few pre-1800 books and not a few pre-1700 volumes. Even more interesting are the pre-1600 books and even a handful of incunables. Most of the old stuff isn't catalogued. Some of it is -- like this little 12mo., above, from Jacobus de Voragines, 1483. Someone has helpfully glued in a barcode. Really rare books are actually expensive to own in terms of heating and air conditioning, protective covers, insurance and suitable (!) cataloguing. So it make sense to know what you own and where to spend scarce preservation dollars. I'm a Lone Arranger archivist, not a rare books librarian, so it's more guesswork than science, but I find the resources of ViaLibri, Worldcat and even Google to be pretty handy. 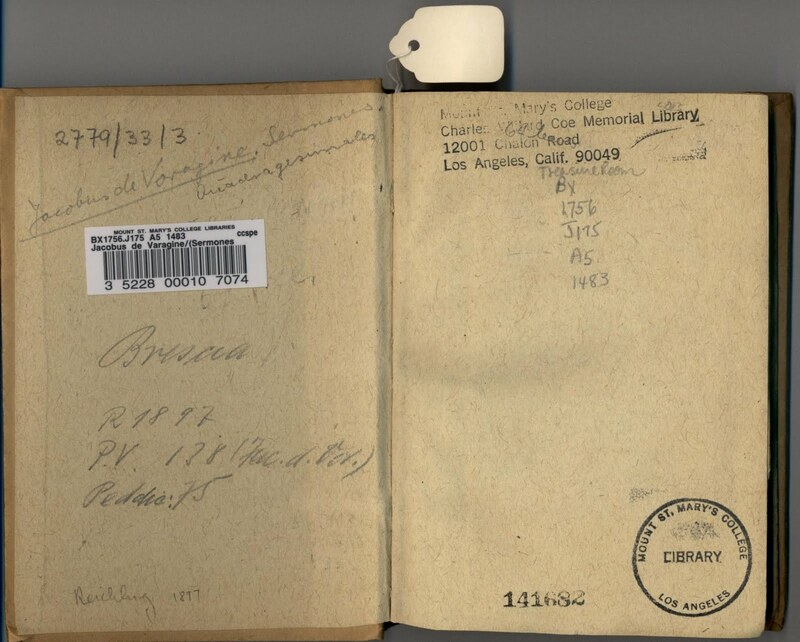 I try to find out who else holds the book, where they've got it (stacks, storage, or special collections) what a copy might be selling for, and whether it has been digitized. Even if I find a treasure, the best I can do is tie a little cotton tape around it and put it in a buffered box, the pre-cut and -scored kind sold by Hollinger-MetalEdge and Gaylord. Because it's beyond the capacity of our tech services department to catalogue these items -- many of which have been owned by the college for decades -- I've created a list in Worldcat of what I find that looks interesting. Since I haven't mentioned it to anybody, I was surprised today to see that four people have looked at it. So what are my ad hoc, personal criteria for rarity? What warrants a $3 box? This Lone Arranger doesn't have too much time for old books -- not with a backlog that just grew by a couple of yards -- but it's a nice break in the routine to pick something off the shelf and see what I can find out in an hour or two. The really nice thing is, it's all win-win; anything I do back there in the shelves is a net benefit. And let's face it -- building boxes and tying neat bows is really a pleasure.